With the holiday season in full swing hiking time is pretty limited but I still managed to get out this past weekend for a short hike/run. 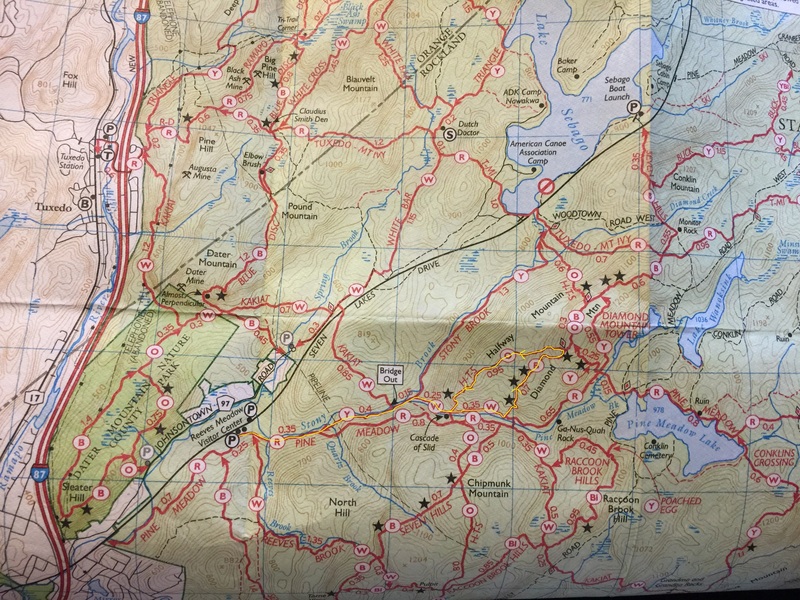 I decided to do another hiking variation starting from the Reeves Meadow Visitor Center. I arrived in the early afternoon and the parking area was still pretty busy but the crowds have definitely lightened up significantly from the warmer months. 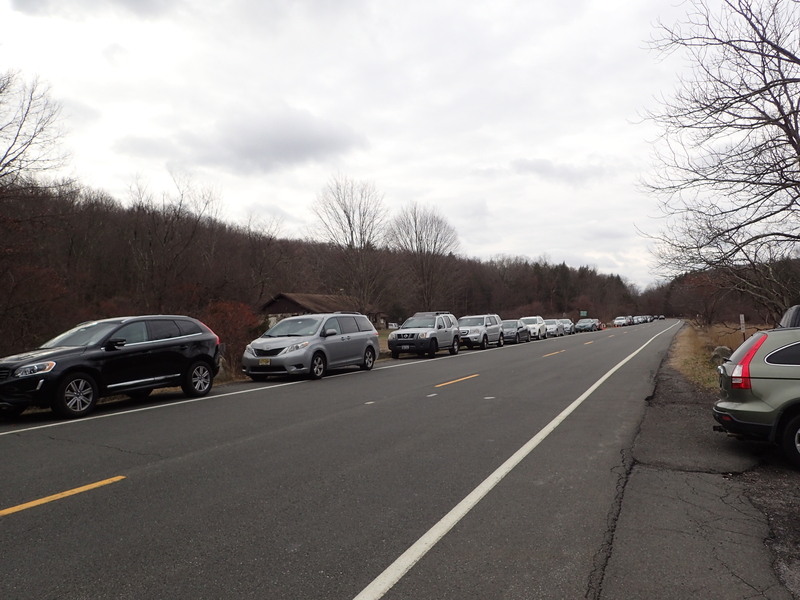 View of cars lined up outside the visitor center. 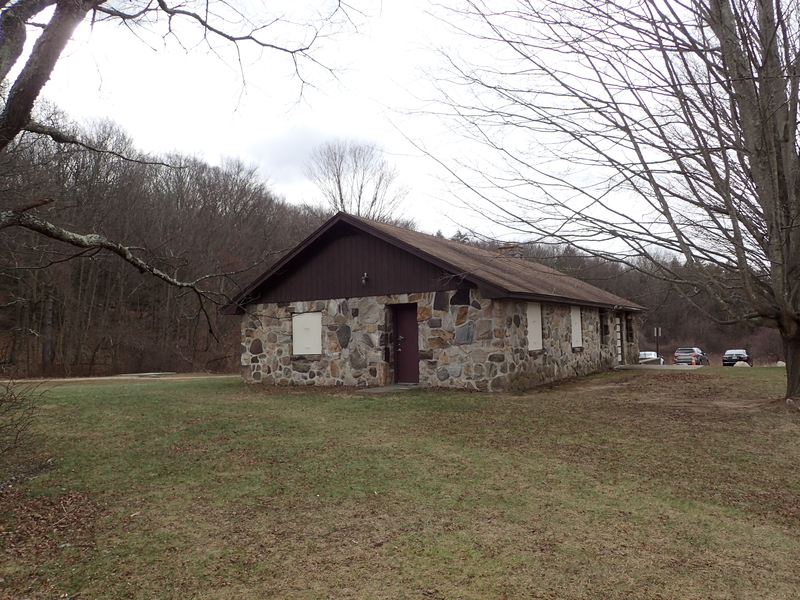 View of the visitor center (currently closed for the season). The red marked trail starts to the left of the visitor center as seen in this photo. 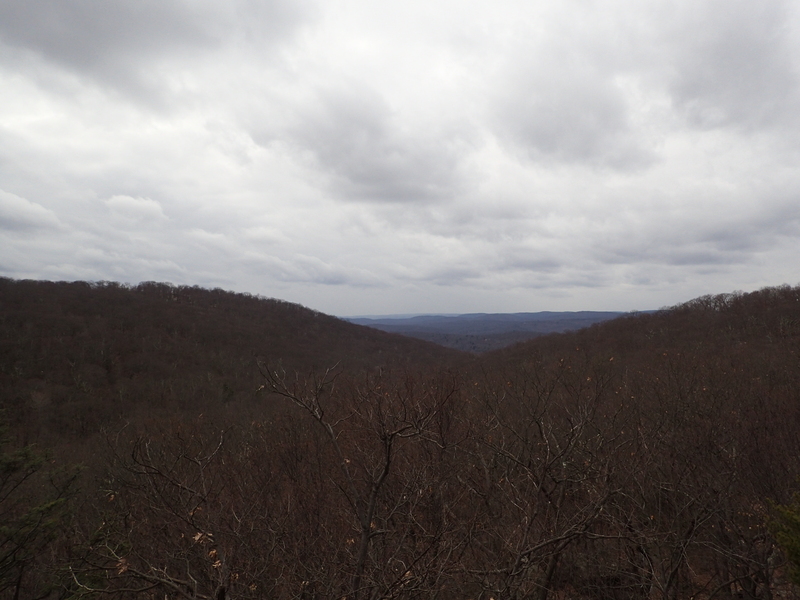 After getting my gear sorted out I headed over to the visitor center and headed down the red marked trail to the left. This section of trail is well traveled and marked so navigation is no issue at all. The trail follows along the side of the brook and on this particular day it was much more flooded than I have seen in the past. View of the start of the trail. A little ways down the trail I reached the first junction of the red marked trail and yellow marked trail. I stayed to my left and continued down the yellow marked trail. View of the first junction with the yellow marked trail. 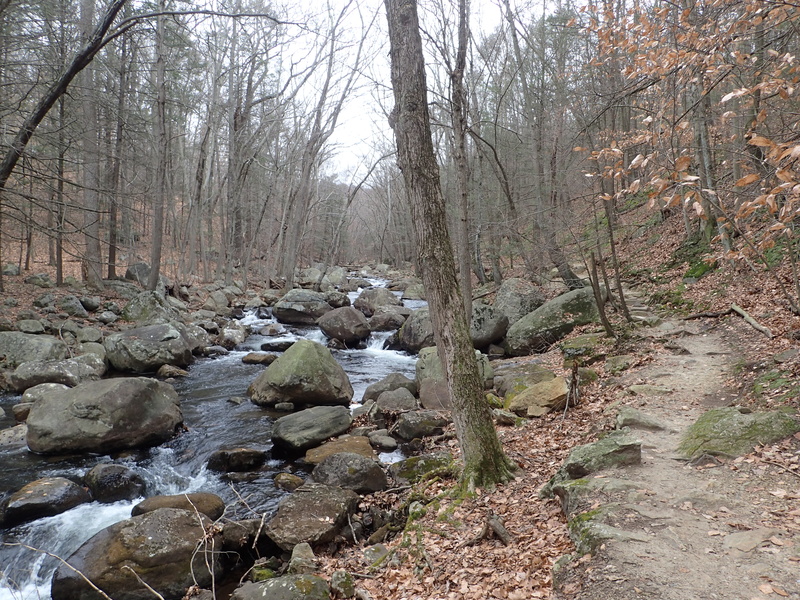 The trail from here is also well marked and very scenic as it meanders along the bank of the brook to your left. I had never been down this particular trail so it was a pleasant surprise to see how nice it was. 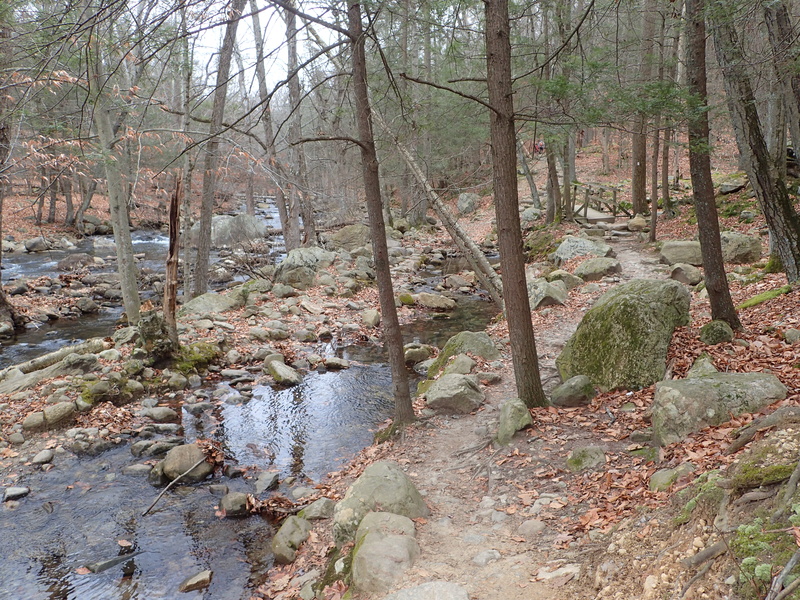 View of the trail along the brook. 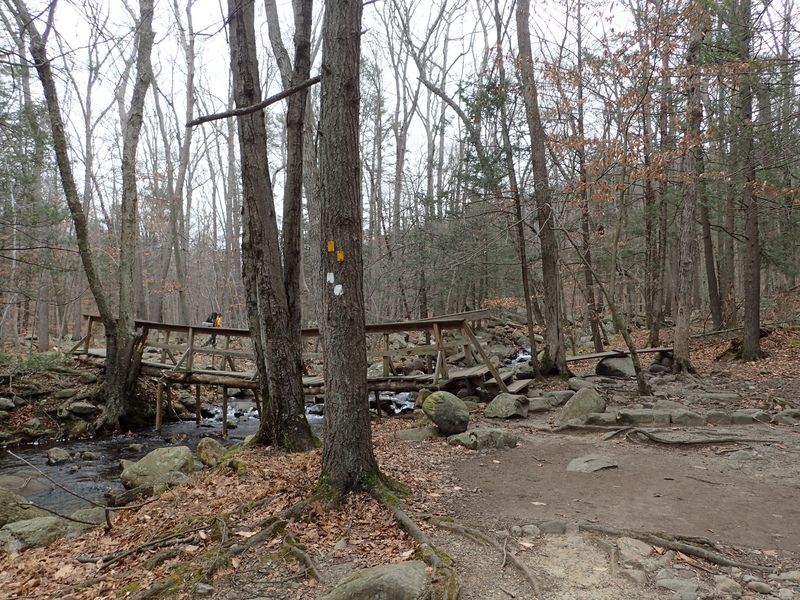 After meandering along the brook I made it to another trail junction with the yellow and white marked trails at a small bridge. View of the trail junction with the white marked trail. The bridge itself was sturdy but I have to say it is in interesting shape. I can only assume it has been hit by debris in the brook on more than one occasion. 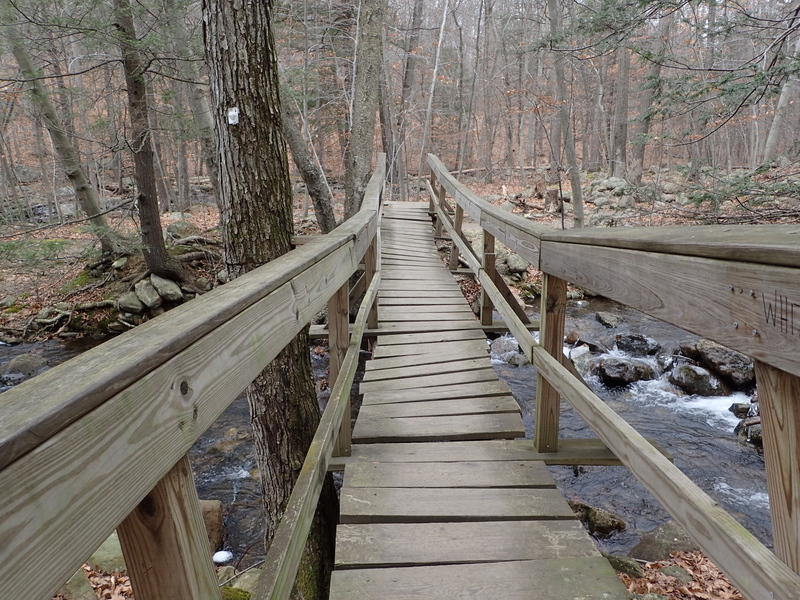 However it is still in better shape than a lot of other similar bridges I have seen while hiking! View of the crooked bridge. 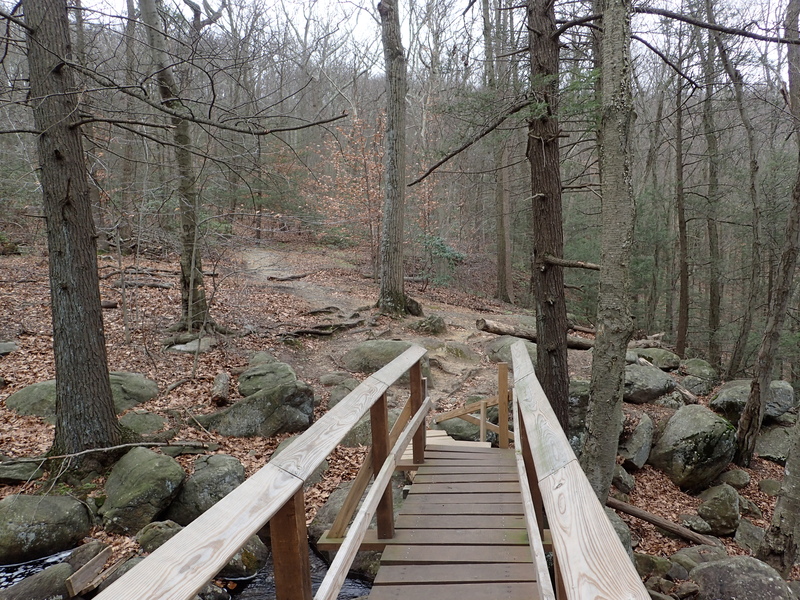 After crossing the bridge I hung a right and continued down the white marked “trail”. 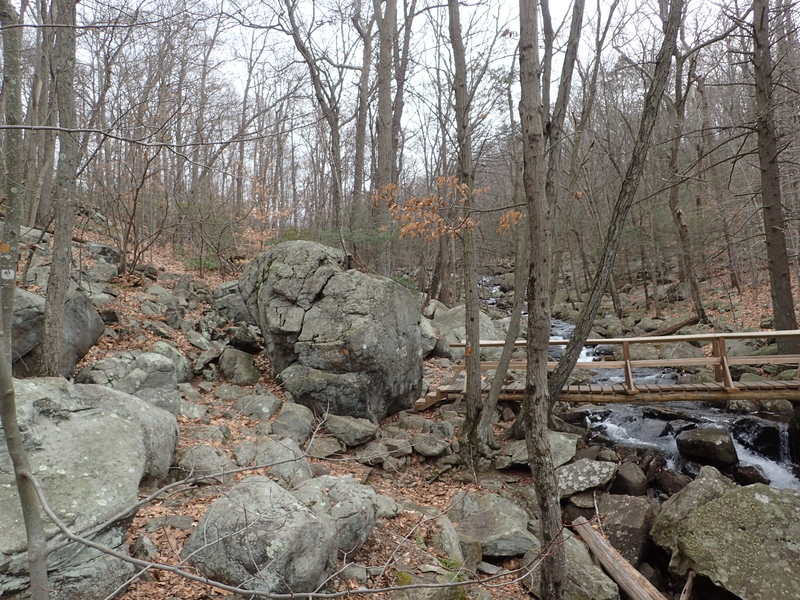 From here the trail follows a path along the brook and over numerous boulders. There isn’t really a trail to follow per say so it is important that you keep an eye on the trail blazes on the trees. 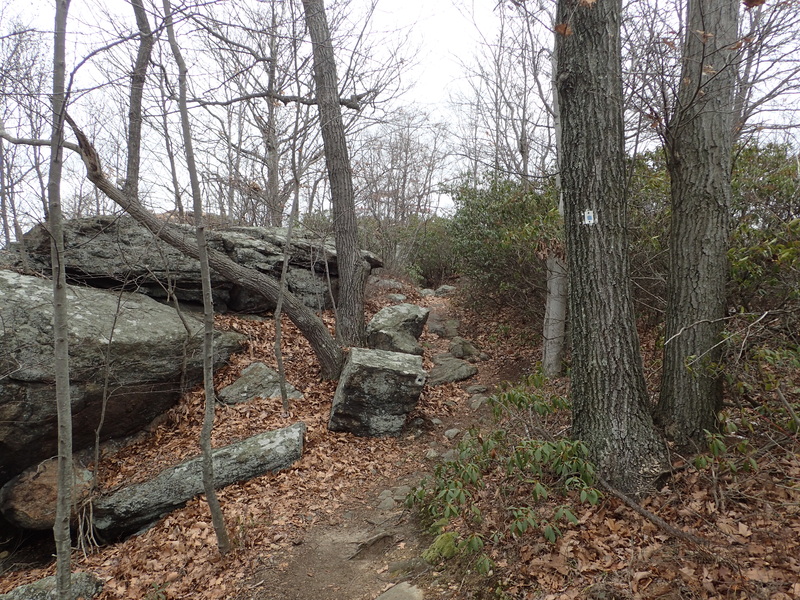 View of the white marked “trail”. 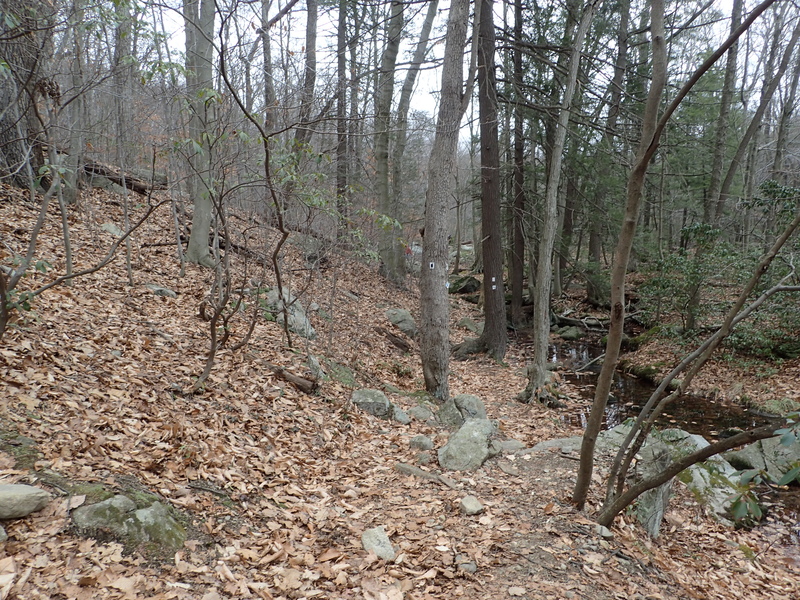 Another view of the white marked trail along the brook. Before too long I reached the next trail junction where the orange marked trail crosses over the white marked trail. From here I continued straight ahead down the white marked trail. View of the next trail junction with the orange marked trail. From here the trail continued through a mostly flat section of trail as I headed towards the next trail junction. View of the trail following the trail junction. After another short distance down the trail I reached the trail junction with the blue marked trail on my left. 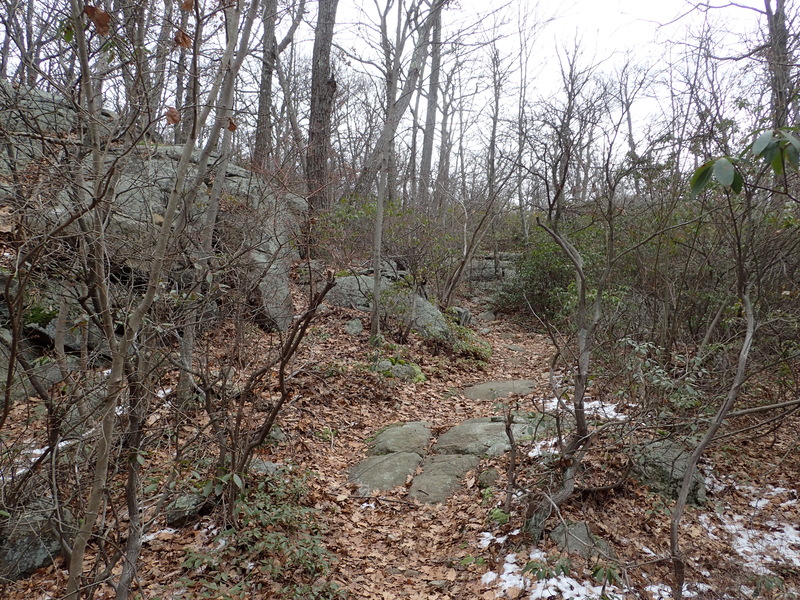 I hung a left onto the blue trail and began working my way up the hill. 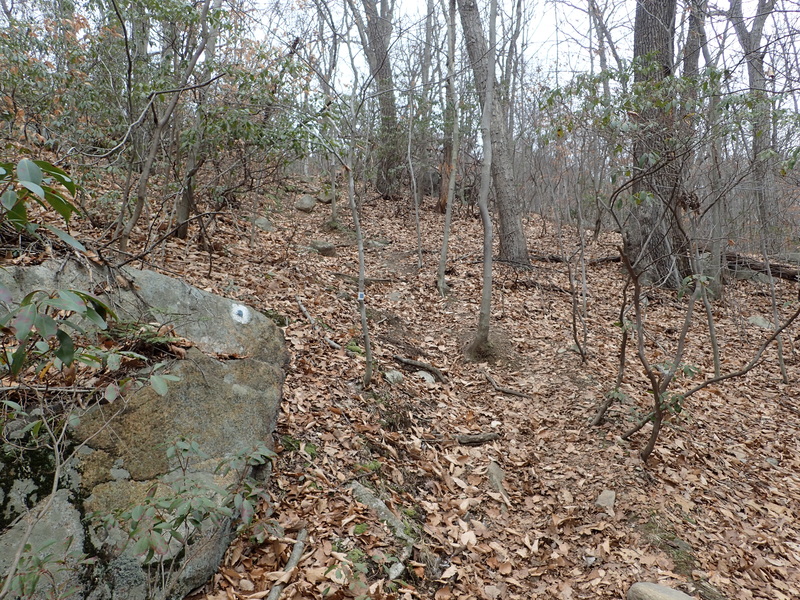 View of the next trail junction with the blue marked trail. Start of the blue marked trail from the junction. 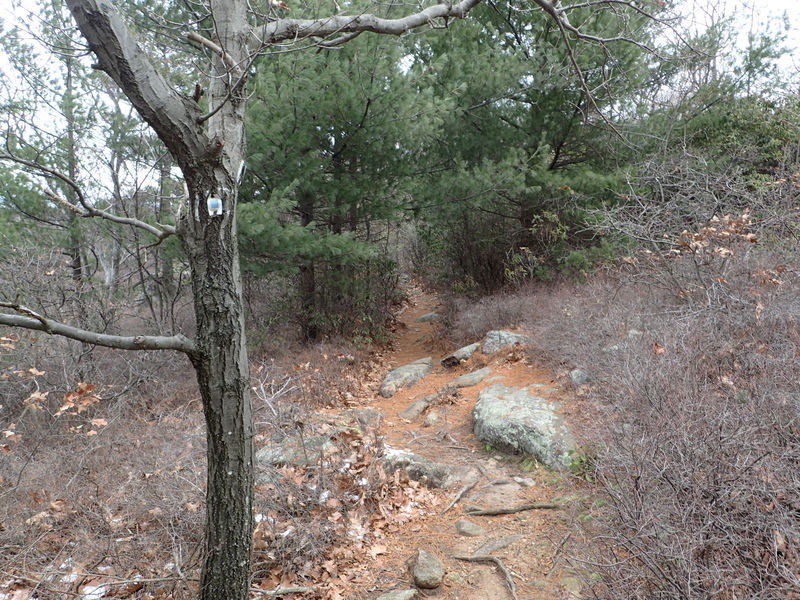 The blue trail starts immediately up a small hill before topping out on a relatively flat area. 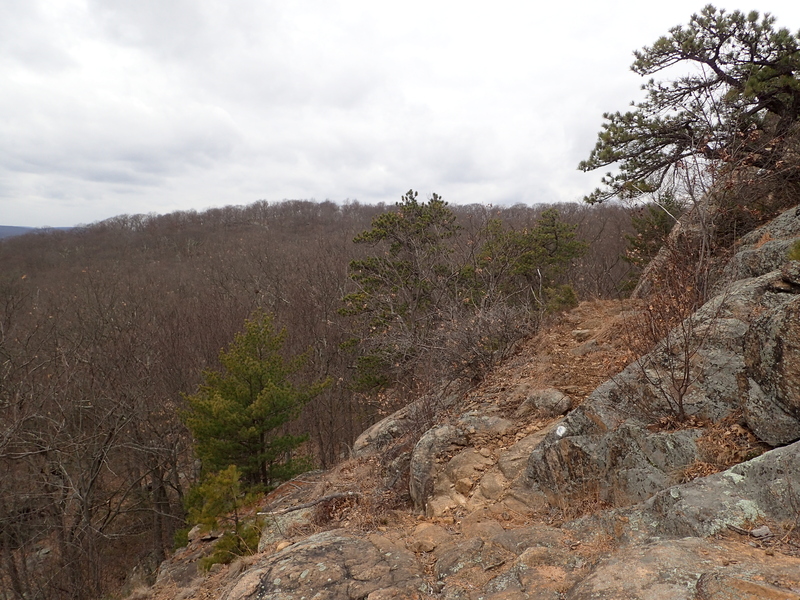 From here you can see a large rock outcrop straight ahead that the trail winds its way up. 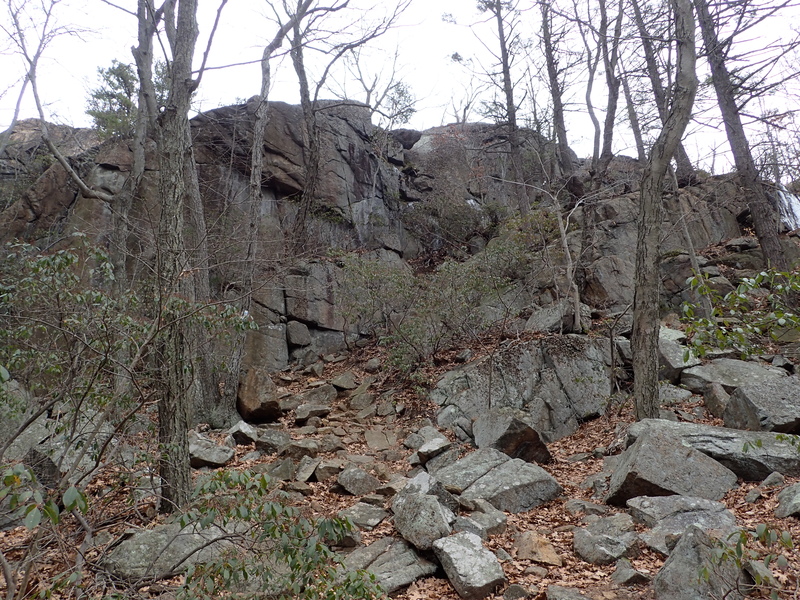 View of the outcrop and rock scramble on the blue trail. 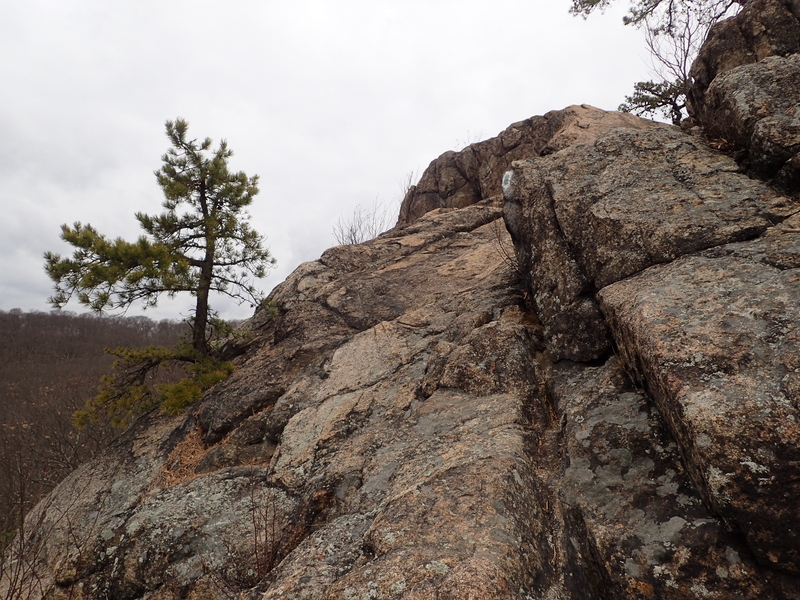 Once I reached the base of the rock outcrop the trail wound its way up a short rock scramble to the top of the rise. View of the short scramble. 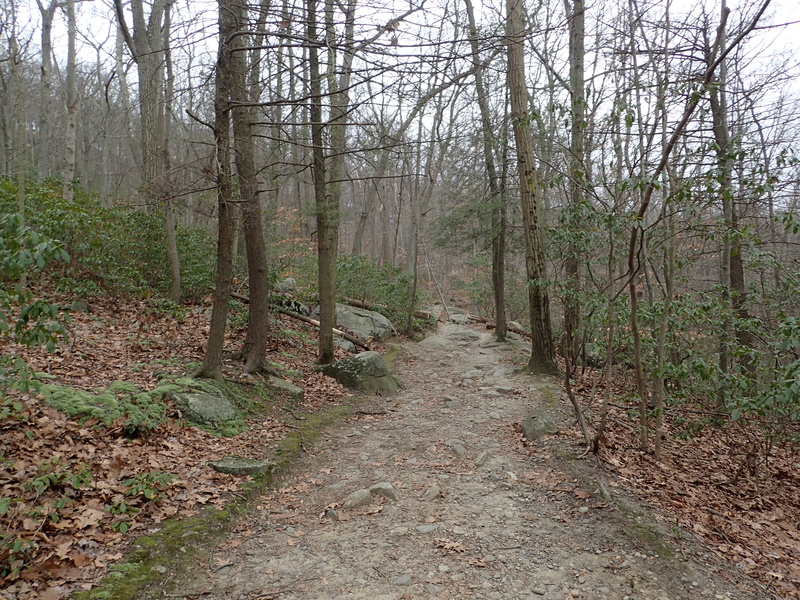 View of the trail following the scramble. 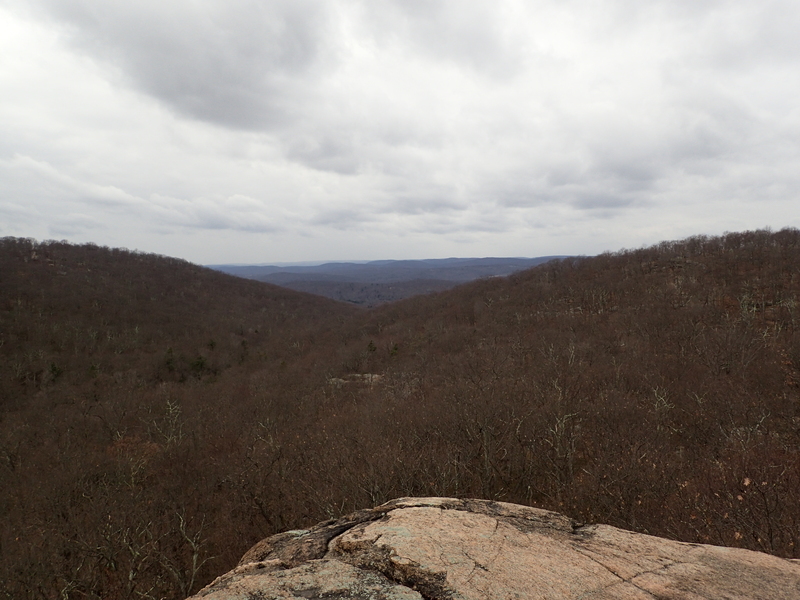 Once I passed the scramble and got to the top of the rise I was greeted by my first and really only views of the day. Despite the winter foliage it was still a real nice spot and not seeing anyone else all day really made it feel pretty far away and quiet. First view of the day from the trail. The trail than continued its way along the top of the hill with small areas of scrambling before reaching the top of the hill and more views of the same area. 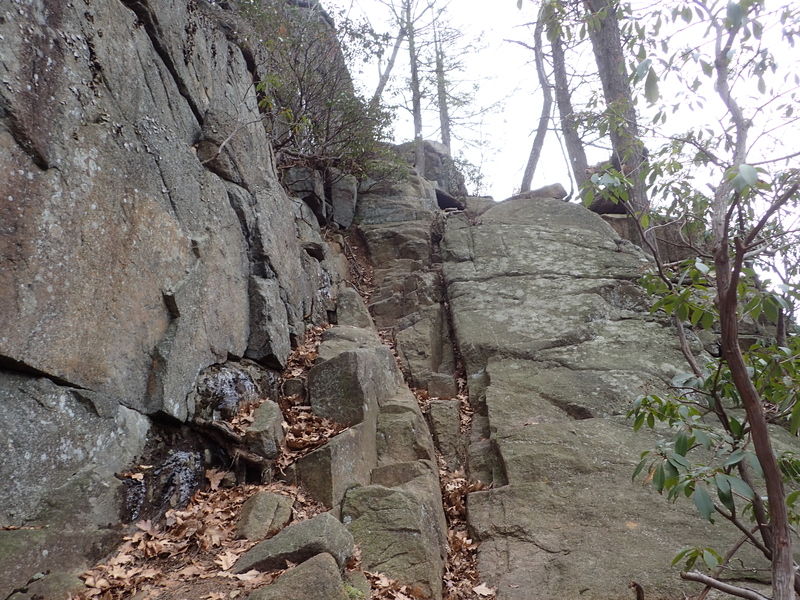 Another short section of scrambling near the top of the hill. Final clear viewpoint from the trail. Once on top of the hill the trail continued along the top of Diamond Mountain before cutting back down into the woods and back towards the way I had come. 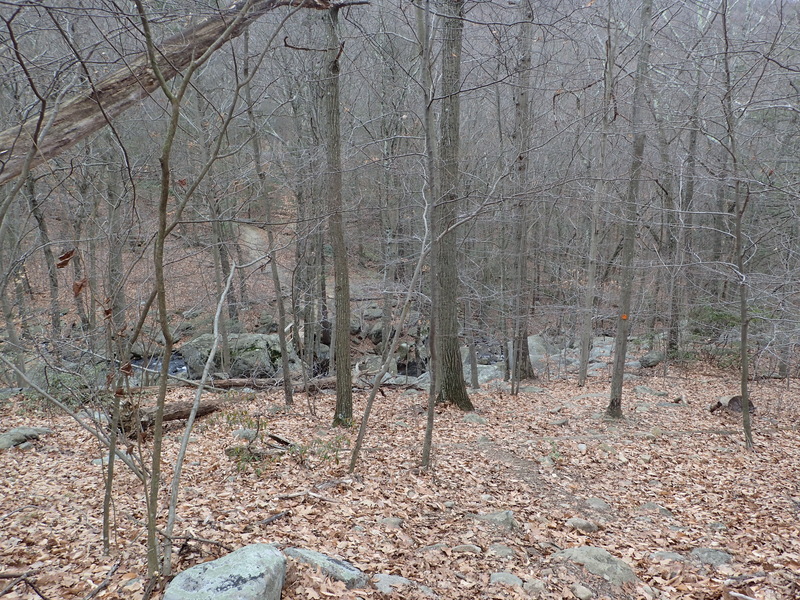 View of the trail on the top of the hill. Before too long the trail meandered up and down the ridge line before opening up to more limited views of the surrounding area. There was even a few spots were some signs of the recent snow fall were still visible. Some signs of winter on the trail. Another view from further down the trail. 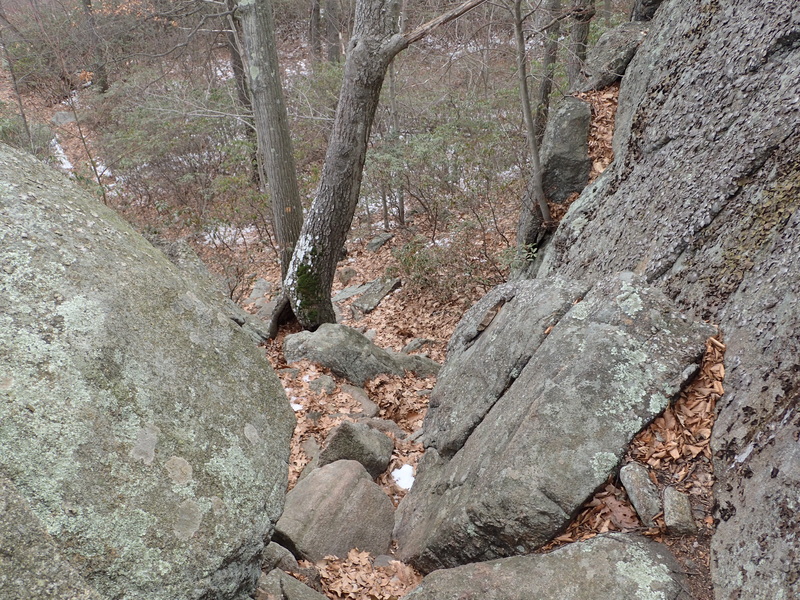 After a little while of hiking along the trail I reached the next junction with the orange marked trail. 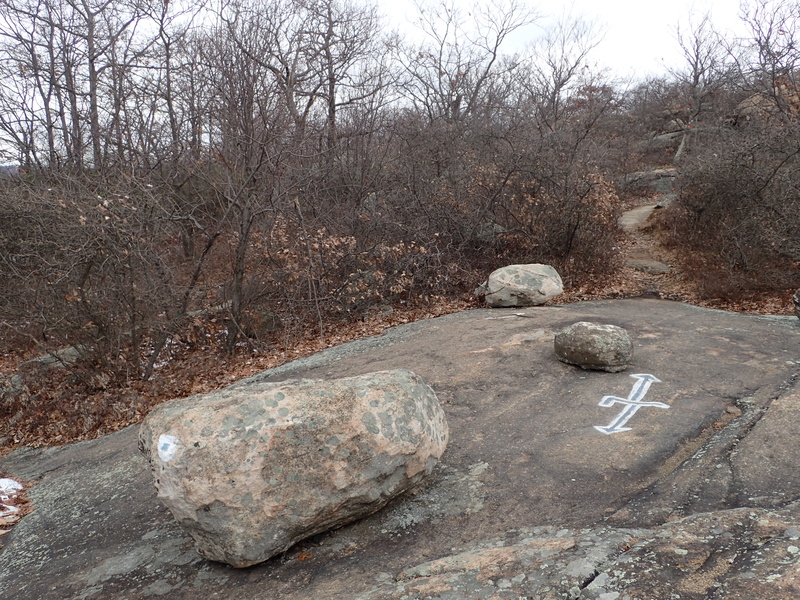 The trail blaze painted directly on the rock slab at your feet marks the location. Once I reached the junction I hung a left down the orange marked trail. View of the junction with the orange marked trail. 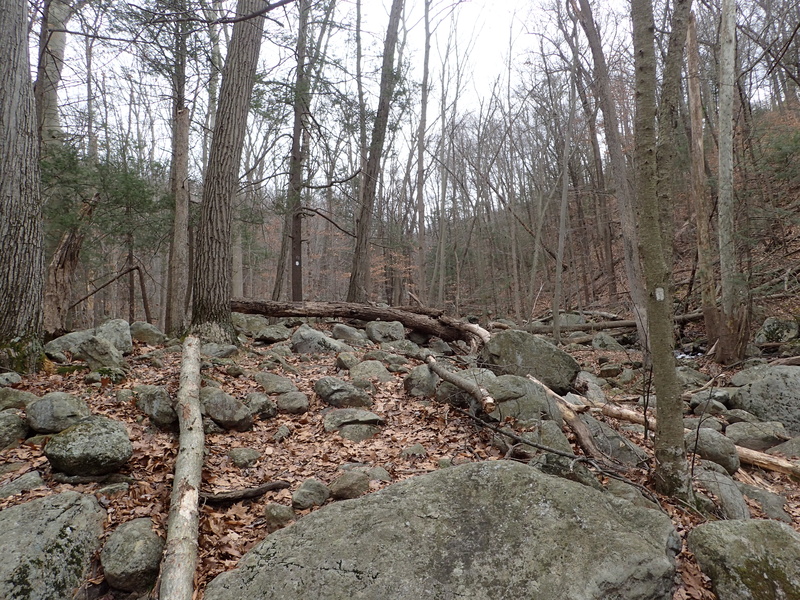 After turning at the junction I reached one short scramble down the rocky hill before the trail continued through the woods back towards the brook. View of the short downhill scramble. 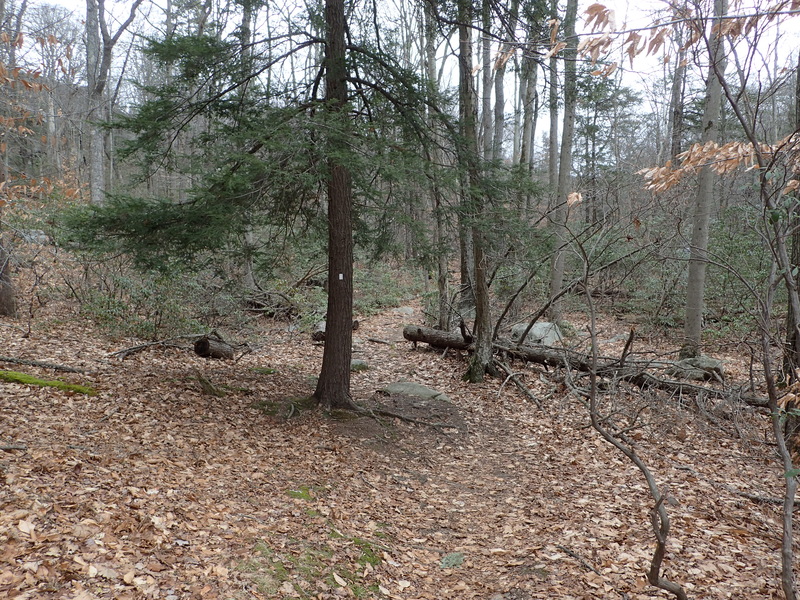 View of the orange marked trail as it continued through the woods. The orange trail was fairly uneventful and easy to follow as it worked its way through the woods and back towards the brook junction I had passed earlier in the day. I made quick time running most of this section of trail and before too long reached the junction I had passed earlier. View as I approached the trail junction with the white trail. Once I reached the junction I decided to go straight over the bridge and back towards the red marked trail. View of the bridge at the junction with the orange trail. After crossing the bridge I continued straight ahead until I reached the T intersection with the red marked trail and hung a right down the large well worn trail. 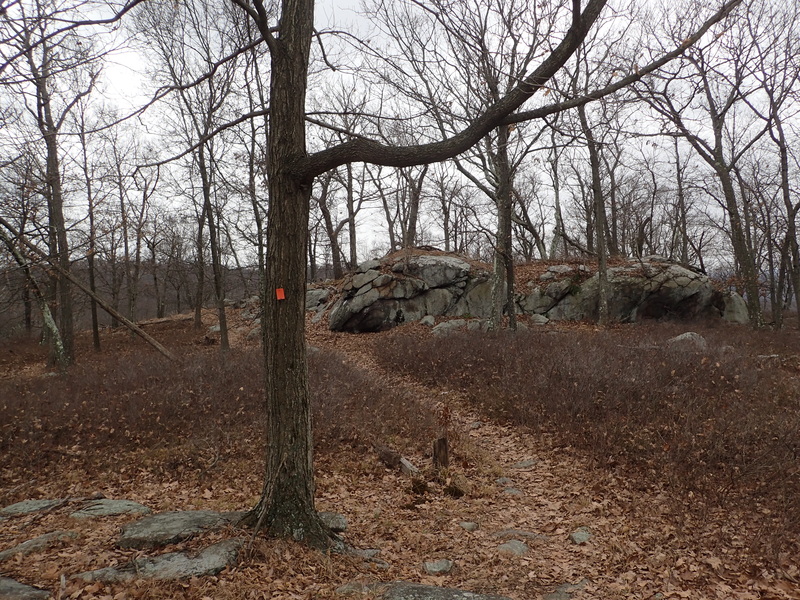 View of the red marked trail at the junction. From here you can continue down the red marked trail all the way back to the visitor center; or alternately you can stay to your right and continue back down the yellow marked trail which I hiked at the start of the day. 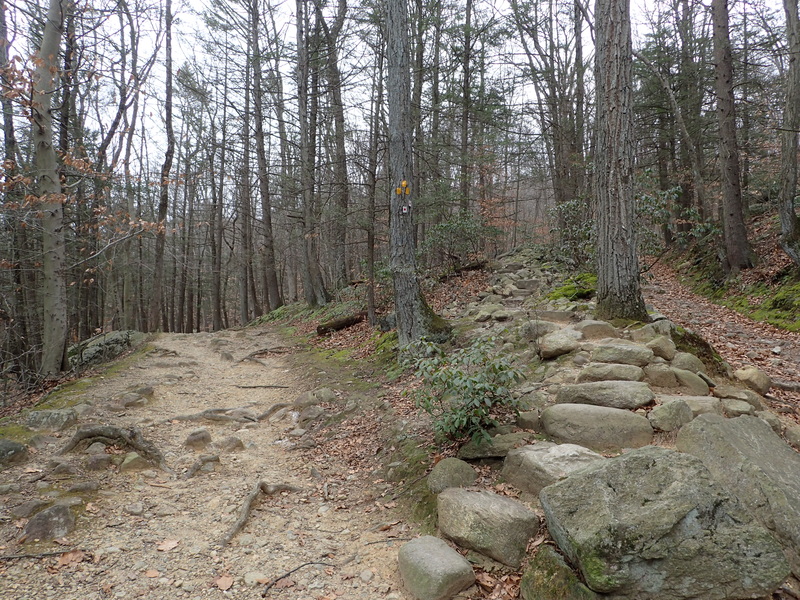 I decided to go back down the yellow trail as I think it is really more scenic. Either trail will take you back to the same place either way. 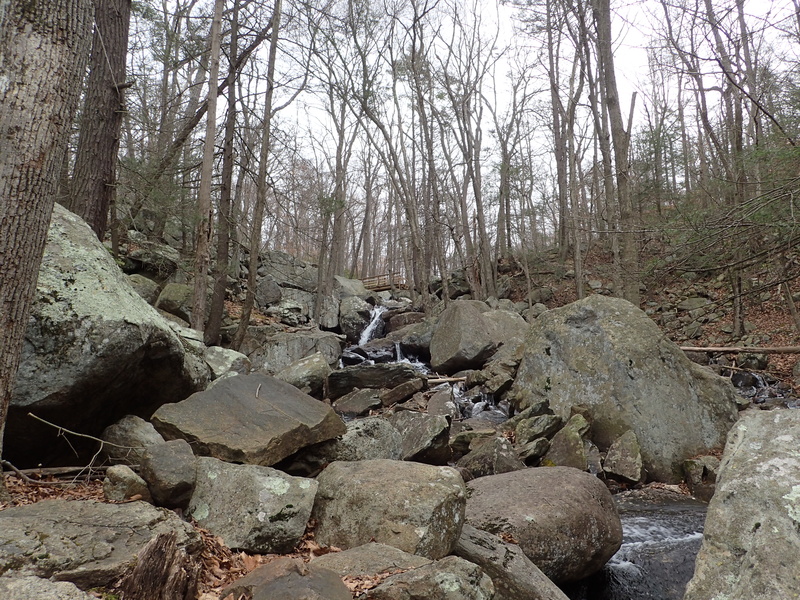 All in all it was a short day out in the woods but I had a nice and quiet hike. 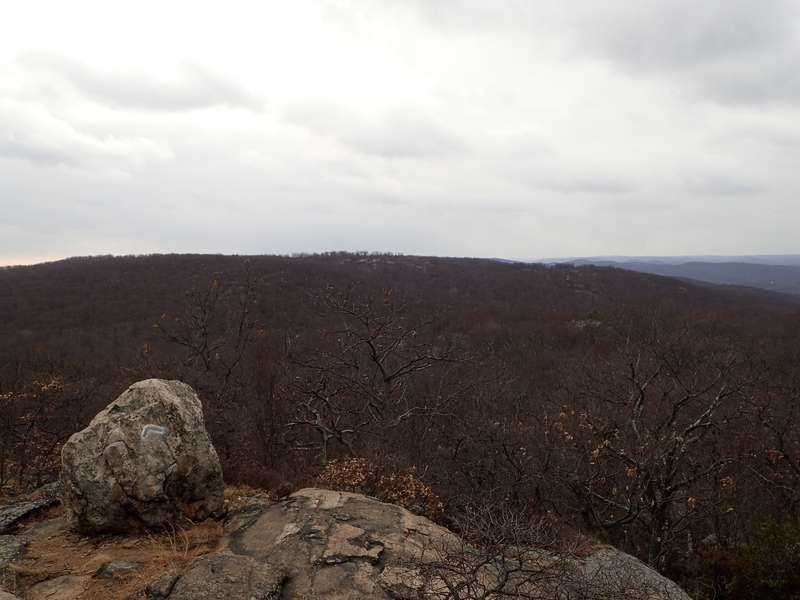 I have said it before but Harriman State Park really is a great choice for hiking in the area if you are close by or your time happens to be limited. I plan to be back soon to explore new trails in the area and also document some longer linkups in the future so be sure to check back or subscribe to the blog.